Are you resolute enough with your human’s resolutions? Are you resolute (VBP) enough with your human’s resolutions? Just yesterday, I was commenting on Sparkle’s excellent (as always, may I add) post on her resolutions for her human: I had planned this present post for yesterday but… guess what? Yesterday’s post was supposed to be posted the day before yesterday but the day before yesterday, I posted nothing because my human claimed to have hurt herself while doing the house cleaning (how worse an excuse can we get from humans, really?!). So if I have, for myself, one resolution for 2013, that would be to be more resolute in having my human stick to her resolutions. We have to keep an iron paw on this stuff, because you know, humans can’t really stick to their resolutions. Note that this resolution for me is really forced on me because of my human. We kitties don’t need no education, er, resolution. Whatever. We are purrfect. 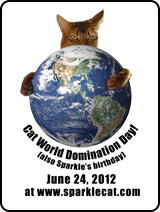 On this, again, I salute Sparkle for reminding this to the humans. Never run out of Greenies again – EVER. Well, I think that’s a good start. I don’t want to ask too much because, you know, humans have their limits (and these limits are quite… limited). Do you think I am asking too much? Are you asking more or less of your human? Tu as raison Texas, il faut fixer des priorités à nos bipèdes domestiques et veiller à ce qu’ils les respectent! Humans need to be challenged and motivated, so keep up the good work Texas! I am asking waaaay less of my human! Blogging less for sure! We need a life. Crack the whip over your human, Texas! An excellent start! State the plan and stick to that Iron Paw! Quelle bonne idée, Texas ! Z’allons faire notre liste pour Phil. dont eat so many Greenies, you’ll be fat like Fin. Texas, you have so many things to take care of and you have your paw on everything. That’s great. We’re going to see if Mom will pay attention to the resolutions we think up for her. Thanks for the idea!!! Texas you are so wise! Thank you SO much, you can’t imagine how much we’re enjoying them! Rumblemummy LOVES the Strand bag – she’s always wanted to go there to see the books! Texas, me wanted to publish a list of resolutions for my Mommy, but she says since she transcribes most of my posts that a list of over 100 is NOT going to happen. I tried to negotiate, but she said she would only when the NHL Strike/Lockout is over. She has made no resolutions – sigh. At least that way she won’t break any! I hope you can keep her in line this year, resolute! We agree with never running out of Greenies, for sure. We think there will be plenty of snow this season here and where you live, so we can have frosty treats. I told my Human that she should resolve to help me blog every day again this year but she just looked at me and rolled her eyes. I don’t really know what that means. Your human sounds about as good as mine – really where do we get them from? Good Luck pal, don’t wear yourself out! 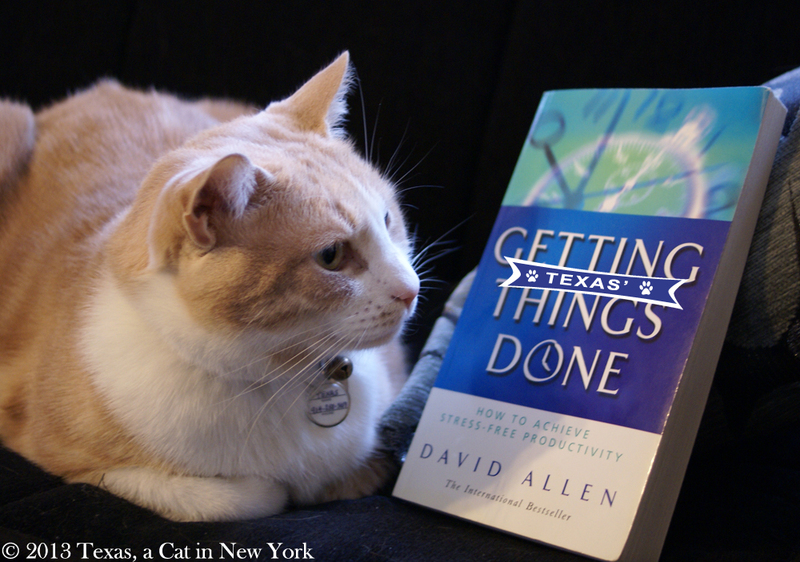 Hi Texas….well it’s a great idea to make resolutions for our humans (!) but they NEVER follow them so I kinda gave up on that years ago. My humans are the type that have minds of their own….the best I can pawsibly do is “MANAGE” them….but getting them to stick to resolutions? NEVER! It’s tough living with humans sometimes! you are a hard task-master dear Texas, but I do get your point..we humans are not a purrfect as you pussies…I envy the fact that you can lie around all day , nothing to disturb you except the need to stand, strech, turn around and lie down again. Of course there is the time when ‘food; is calling..then you really become alive and attentive. Like you say you will need to keep an ‘iron-paw’ on your human’s resolutions but do bear in mind that humans make the same resolutions year after year after year and never ever get them resolved! Happy New Year to all of you :) Bonne Annee!! Looks like you wear the ‘pants’ in the family and we cats know that being the boss is different that being bossy, hahameow!